Leica's sole Televid eyepiece is their 25-50x Aspheric zoom which fits both their 65mm and 82mm scope bodies. If you need more magnification and have an angled Televid body, try their Extender 1.8x which converts 25-50x to 45-90x. Leica has eliminated fixed eyepieces from their catalog. Their only eyepiece is the 25-50x zoom. 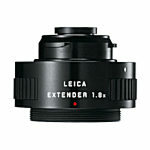 There is also a 1.8x extender for extra magnification.